If you are looking forward to enjoying a good and energetic tennis session, the Tennis Center Novak is the perfect place to have a good game. 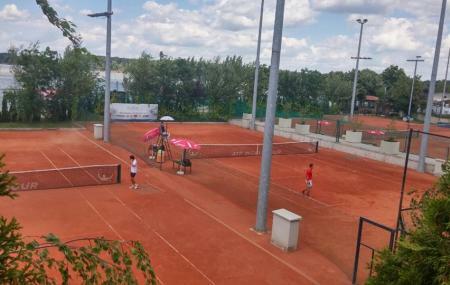 Located in the capital of the southeast European country of Serbia, Belgrade, the tennis court is owned by Novak Djokovic and is popular spot among the tourists as well regular players. An ideal place to visit with your friends or family to enjoy an adrenaline pumping sport, this court is open all days of the week between 0800 hours to 2200 hours and can be accessed at a very nominal fee. The courts are spread in an expansive area and offers coaching for all levels from amateurs to professionals. Sjajan centar, sjajni ljudi i to sve kod našeg najboljeg sportiste svih vremena. Prava je privilegija doci ovde. Trenirati, odigrati i popiti pice ili rucati. Eng. It is freat centre. It is priviledge to come and train here. Play tenis matches and be there. You are more then welcome here! Caffee service is slow and not professional. Court administration is polite and correct. Maintenance not so good anymore. An amazing piece of work. Worthy a visit of ★ Belgrade ★ for this. Recommended! ★★ Beautiful ★★ BRAVO NOLEEEEEE! Good place for tennis playing! Has a wonderful indoor swimming pool and outdoor as well that can be enjoyed by many along with pristine red clay tennis courts. Restaurant is centrally located and there are nice lounge areas. Well done ... All we need are the camera systems for monitoring bad calls on courts.